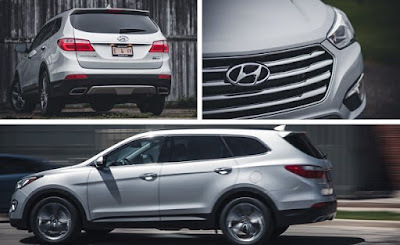 Overview: The current-generation Hyundai Santa Fe crossover debuted for 2013, at which point the model line grew to include the smaller, five-passenger Santa Fe Sport and the larger Santa Fe proper—the model we’re reviewing here—with seating for seven. The larger version is available only with a 290-hp 3.3-liter V-6 and six-speed automatic gearbox, along with either front- or all-wheel drive ($1750). 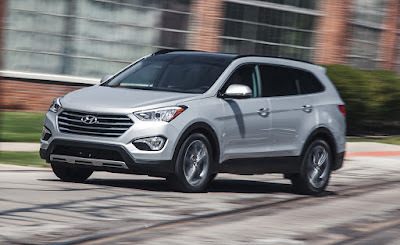 The 2015 Hyundai Santa Fe is a direct competitor to other prominent three-row utes such as the Chevrolet Traverse, the Ford Explorer, the Kia Sorento, and the Honda Pilot, among several others. Sleek yet understated, the Hyundai isn’t as glitzy as the Kia but is more interesting than the dowdy Chevy. 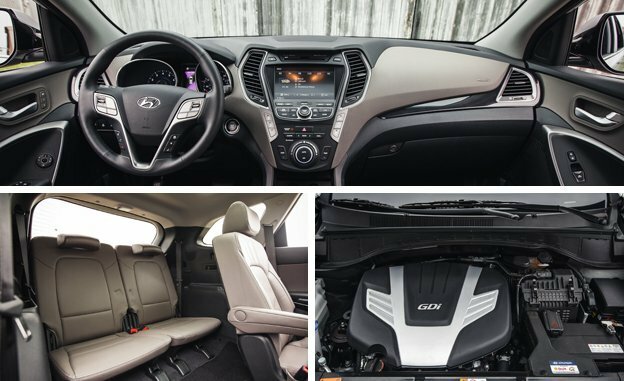 As with other Hyundais, standard and optional equipment is extensive for both of the available trims, with base prices for 2015 ranging from $31,045 for a front-drive GLS to $36,895 for a Limited AWD like the one we drove. Overall performance and drivability are adequate for this size of vehicle, and while it lacks the stuff-hauling versatility of a minivan, the Santa Fe does have available all-wheel traction and the capability to tow 5000 pounds. With its relatively small engine powering more than two tons of SUV, however, our test truck’s EPA combined rating was only 19 mpg. What’s New: Being relatively new, the Santa Fe still looks and feels fresh, receiving only minor updates for 2015. The most notable changes include revised calibrations and a faster processor for the electric power steering—which still can be switched among Comfort, Normal, and Sport modes—to improve steering feel as well as various suspension tweaks to increase body control in corners. The improvements have a minimal effect on driving behavior day-to-day, but the ride is comfortable and nicely composed, and the steering does seem a bit more talkative than before. Also new for 2015 is an optional power liftgate that can be activated by waving your foot underneath the bumper. What We Like: The Santa Fe is a solid and inoffensive package that doesn’t really do anything poorly. It looks handsome, drives competently, feels well made with decent materials, the ergonomics and electronic interface are sound, and the seats are all comfortable and supportive. Even the third row, which is still a smidge tight for larger adults, is better than average. Along with Hyundai’s impressive warranty coverage, the Santa Fe is even more significant for being priced considerably lower than many of its competitors, including the Ford Explorer, which can top $50,000 with options. At $41,695 as tested, our loaded Limited AWD model came with standard 19-inch wheels, second-row captain’s chairs, and numerous safety and convenience features, with the only option being the $4650 Ultimate package (HID headlights, a panoramic sunroof, an eight-inch center screen with navigation, a 12-speaker Infinity stereo, ventilated fronts seats, heated steering wheel and rear seats, and more). What We Don’t Like: Driving pleasure isn’t really in the equation for vehicles like the Santa Fe, save for the relatively entertaining but aging Mazda CX-9, and piloting the Hyundai is a boring experience. Plus, at times it struggles to accelerate without downshifting through multiple gears, which means fuel economy can suffer from all the work the engine has to do. And although the third row is fairly accommodating once you’re back there, climbing over and around the second row is a pain. And we’d be remiss if we didn’t mention the fact that the Santa Fe—and other crossovers of its ilk—trade rugged-ish styling for the greater practicality and interior versatility of something like a minivan. Verdict: Not very interesting but smartly done and all-around capable.